Just in time for your summer barkada gimiks or family outing, SMART recently launched the most affordable 4G pocket WiFi offer priced at only P888. For whether you are surfing the web, posting that perfect selfie on Instagram, sharing a video on Snapchat or navigating via Waze, there is enough juice for up to 10 devices powered by the most reliable LTE connection in the country today. This is also timely for the upcoming school year as the offer is valid until June 2016! The SMART Bro 4G pocket WiFi comes preloaded with 150MB data which is valid for 30 days. Reloading is very convenient as you can do it online via this link where you can select the data package that suits your needs. For our usual road trips, I load up with SurfMax 85 which gives me 2 days of all-day Internet up to 800MB. Payment is conveniently deducted from your airtime load for prepaid or billed to your postpaid account. 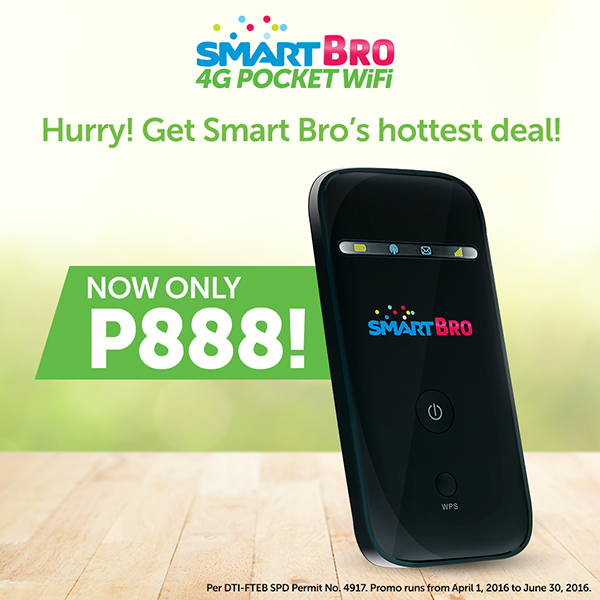 The SMART Bro 4G pocket WiFi is available via the SMART online store. Payment options include VISA, Mastercard, ECPay, and even Cash on Delivery. Shipping is FREE nationwide. how to put password on this pocket wifi? Check the settings in password field in dashboard. While connected to the Wifi, go to 192.168.1.1 in a browser. Go to settings - basic settings - then where it says open, you can select one of the options there til you see Pass Phrase. Change it from there. Instructions are also in the Quick Start Manual of the device. Anu ano po ang requiments para kumuha ng pocket wifi? saan po makkita yung dating pass ng wifi ?